The annual Stampin' Up! Leadership Conference kicks off in Houston, TX. WooHoo! No, this year I'll be enjoying all the excitement from my smartphone Facebook feed. Life is full of tough choices and this year, I had to make one of them and chose to travel to Boston this week to be with Emma and her skating team as they compete. And ya know what? As much as I'll miss seeing so many of my amazing friends, I would have missed being with my girl SO much more! I've only got her under my roof full time for 2 1/2 more years and I don't want to miss a minute with her. That's one of the beautiful things about my job - it's my schedule, not someone else's. The last time I missed one of Emma's competitions was for Leadership Conference in Phoenix, AZ. I remember sitting in the hotel bar with my laptop and about 15 of my closest friends watching her team skate that evening. I couldn't have physically gotten from Phoenix to Boston in time to be there in person so the live feed was it and the hotel bar was the only place that had WiFi back then. I remember thinking - never again. So, while I wish all my SU! friends safe travels and fun times - I get to be where I need and want to be the most - with my girl. Anyway - enough about that, here's the card I teased you with on my Facebook page last week. What? You don't follow me on Facebook? Here's the link - Trinity Design Studio - Paper Crafting and FUN! click it right now and go LIKE my page! Do you really want to miss anything? No? Ok, good. Go do it now, I'll wait right here. The card today is for my swap group the GoDivas (as in chocolate!). They will all be getting this one in the mail in a few days, but YOU get to see it first! I used the girl baby shoes stamp from the new Baby, We've Grown! 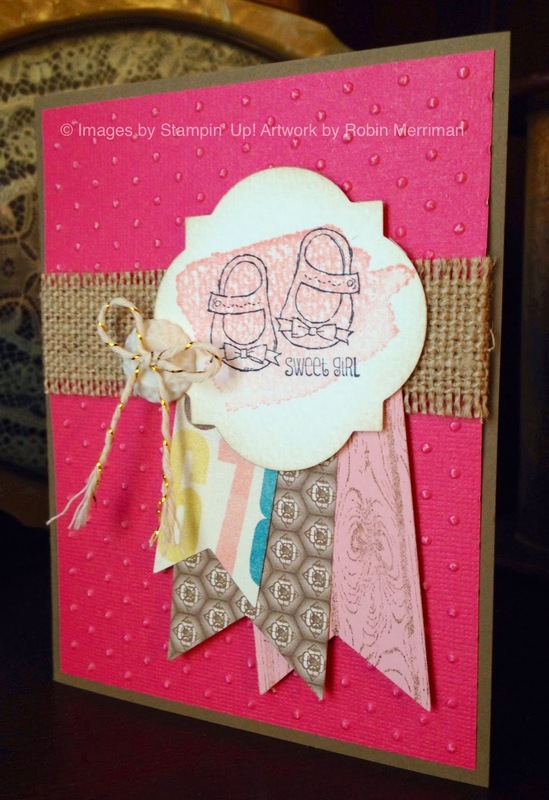 stamp set from the Occasions Mini for my focal image. The oh, so versatile watercolor splash stamp from the Happy Watercolor stamp set creates a soft pink wash for the background. The little flags are cut out of Designer Paper from the Soho Subway and Venetian Romance packs and I made my own designer paper for the last one. 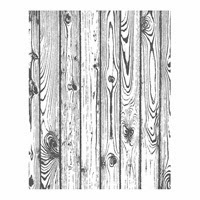 It's the new Woodgrain background stamp in Soft Suede on Blushing Bride cardstock. Cool, huh? I cut out the flags with my Big Shot and the NEW Banners Framelits dies. These will be a favorite - just buy them now, you'll thank me later. The background was done with Primrose Petals Co'ordinations Cardstock, dry embossed with the Polka-Dot folder and my Big Shot. I wrapped it with a piece of Burlap Ribbon that I trimmed off the edges and pulled some strands out of to make it more rough. 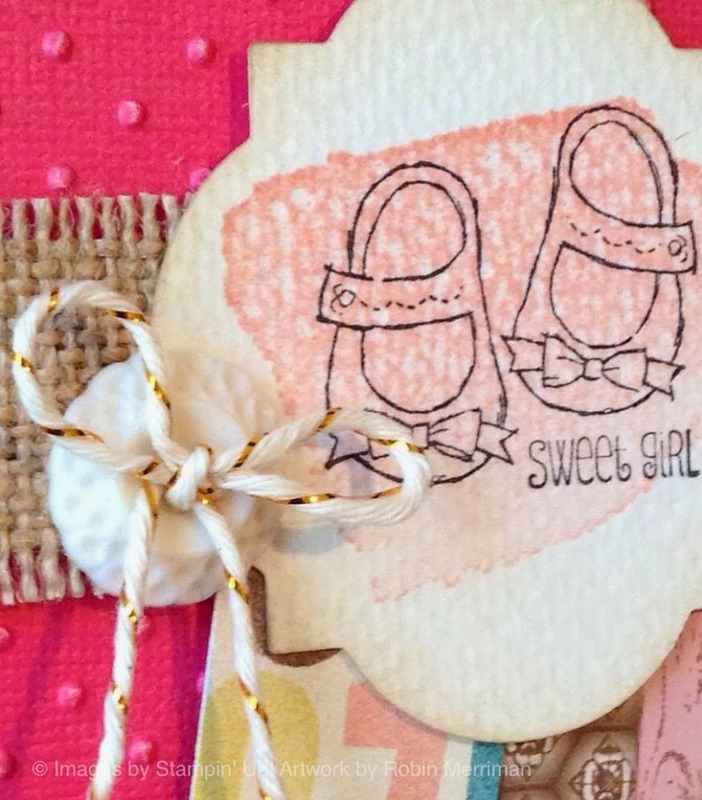 Finishing touches of an Antique Button and some of the NEW yummy Gold Baker's Twine made me smile. How about you? You can visit my website for a link to my Online Store and shop for these plus everything else I used to make this card. Have a wonderful day everyone and happy stampin'!